﻿Our studies do require that families come to the lab to participate. However, ﻿parking is free and close to the lab! ﻿Our lab is located at Brock University. ﻿The Brock University campus is located at 1812 Sir Isaac Brock Way in St. Catharines. Enter from St. David's Road (at Merritville Highway). Turn right at first stop sign (Meter Road). Take first right into "Reserved A" parking lot. Lifespan spaces are to the right of the entrance, next to the handicap spaces, on the south side of the parking lot. Please stay with your car and a SCDLab member will meet you there! Parking is available very close to the lab. 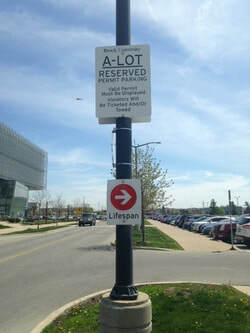 The Lifespan Centre parking lot has reserved spots for the lab and the parking is free! When you arrive you will be met by a SCDLab member and you will be brought up to the lab!